MakaiPlan Pro uses a rigorous and thoroughly validated 3D dynamic model of the cable in its simulations. This same cable model also powers the MakaiLay software, which has been used to accurately install more than 500,000 km of subsea cable. MakaiPlan Pro enables powerful and precise 3D, dynamic simulations of submarine cable installations. Cable operators can quickly simulate an entire cable lay in advance and in the office at up to 50 times faster than real-time. An entire trans-oceanic lay simulation can be completed in one day. MakaiPlan Pro is an extension of the successful cable route planning software, MakaiPlan and also includes all the planning features of MakaiPlan. The primary benefit of MakaiPlan Pro is to give the cable operators a deep understanding of the expected cable behavior during their particular lay. Investing the time to know what to expect before going to sea is a cost effective way to avoid expensive delays and major risks to the cable during installation. A detailed simulation helps operators understand and plan for the impact on the cable of dynamic situations such as vessel starts and stops, repeater deployments, strong crosscurrents, and sharp alter-courses. Once simulations are performed, in which the cable is laid on course and with acceptable bottom slack or tension, MakaiPlan Pro can create a detailed Ship Plan which will be used to provide navigation and cable payout instructions during installation. MakaiPlan Pro can also be used for feasibility studies and trade-off analyses (e.g., equipment used vs. costs vs. accuracy achieved), training cable engineers, and for pre-lay and post-lay analysis. MakaiPlan Pro has the tools to generate a preliminary ship plan: a detailed set of ship and cable payout instructions for installing the cable along a given submarine cable route. The Ship Plan is similar to a Route Position List (RPL) except that it is surface oriented and defines ship movements and cable payout instructions. MakaiPlan Pro can generate a preliminary Ship Plan quickly and automatically based on simple steady-state approximations to the cable installation process. This provides a first-cut at a Ship Plan, which is then refined and improved based on detailed dynamic simulation results. 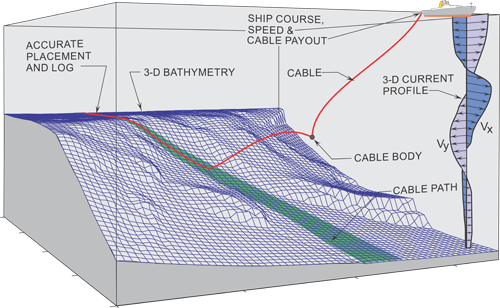 MakaiPlan Pro includes a state-of-the-art cable installation model that can quickly and accurately compute the cable shape and movement during a submarine cable lay. 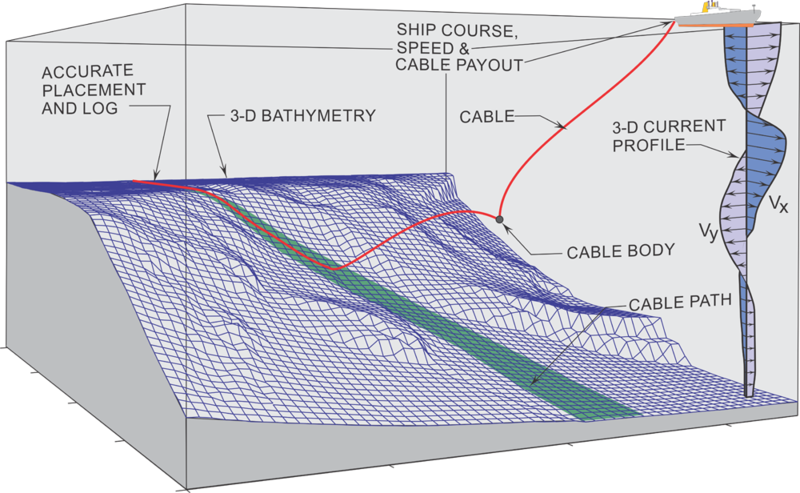 MakaiPlan Pro’s cable model computes the complex, three-dimensional, dynamic shape of the cable between the ship and the touchdown under nearly any sequence of ship movements and cable payout. The model also takes into account cable type changes and inline cable bodies as well as changing bottom bathymetry and ocean currents. Makai’s model has been rigorously tested and calibrated at-sea. As a result, the cable touchdown conditions – location, slack/tension and even bottom dragging – can be computed accurately. During a simulation, MakaiPlan Pro allows users to fully visualize the dynamic installation process in 3D and provides detailed numerical output of all the relevant parameters affecting the lay. A screenshot of MakaiPlan Pro, showing the Plan View (top left), the Profile View (bottom left), the 3D Viewer (right), Lay Summary (far right) along with other controls and information about the simulated lay in progress. With MakaiPlan Pro, the cable installation can be simulated in detail and refinements can be made to the preliminary Ship Plan. With the aid of a dynamic 3D simulation of the lay, operators can look at the entire installation, minute-by-minute, and observe the slack or tension at the seabed, and the position of the cable along all portions of the route. This analysis can be accomplished at up to 50 times faster than real time. Every single event during installation (repeater touchdowns, alter-courses, splices, slowdowns and stops, etc.) can be graphically and numerically reviewed. Adjustments can be incorporated into the Ship Plan to compensate for these dynamic events and make sure the cable is properly installed as specified by the Route Position List. MakaiPlan Pro includes a feature called Look Ahead, which enables the operators to look into the future and determine the impact on the cable lay for a given set of actions. This allows operators to quickly test “what if” scenarios and decide on the best plan forward. This tool is very useful for in-office simulations to properly modify and optimize the ship plan, and is also a critical tool for resolving unexpected situations at-sea. With MakaiPlan Pro, users can make all the mistakes in advance on the simulator when they can be easily corrected and before they become costly at-sea disasters. Simulations produced by MakaiPlan Pro can be used to determine the feasibility of the given cable installation, taking into account ship and other equipment limitations as well as the expected environmental conditions. Simulations can be run to include typical at-sea instrument and operator errors. Instruments errors such as GPS position errors, cable length measurement errors and errors in the knowledge of the ocean currents and bathymetry can be easily incorporated in the simulations. Operator errors, such as how well the helmsman and cable engine operators can follow the instructions, can also be incorporated in the simulation. Using these results, an error budget analysis can be produced which will aid in determining the factors that are limiting the operation. 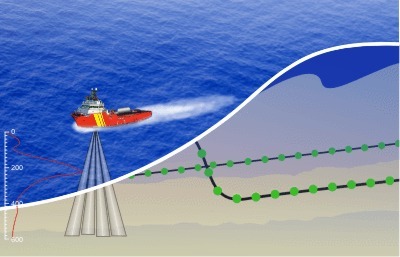 These computer simulations realistically reproduce actual at-sea lay conditions and allow the planner to estimate the probability of success to achieve the desired cable touchdown positions and the cable slack (or tension) at the seabed. Will a more expensive ADCP with longer range meaningfully improve my installation accuracy? Do I need to use transponders attached to the cable to meet the required installation accuracy? How does the installation speed affect my placement accuracy? Do I need a DP vessel? Answering these questions allows the operator to present the client with a trade-off analysis of equipment costs vs. accuracy achieved and risk minimization. This analysis is objective and backed up by rigorous modeling results, making it much easier to convince project management of the need for having the right equipment on board. Using an ADCP to measure currents versus depth in real time. MakaiPlan Pro can generate and use time varying and depth varying current profiles in the simulated installation/retrieval runs to accurately represent the ocean currents you would expect at the site. The user can then evaluate how these currents would affect the accuracy for the placement of the OBC sensors as well as their effect on the tensions and cable dragging during retrieval. With these results, the user can evaluate whether the use of an Acoustic Doppler Current Profiler (ADCP) is warranted during the installation in order to achieve the desired accuracies. MakaiPlan Pro is very similar in operation to MakaiLay – Makai’s at-sea cable monitoring, logging, navigating and controlling software. Operators can run entire cable installations prior to going to sea in order to become familiar with the software, cable installation concepts, and the details of a particular lay. This training prepares them to run successful at-sea lay operations. MakaiPlan Pro can be used to simulate in detail a cable installation after the installation has been completed using the installation logs. As-laid cable paths can be refined and potential seabed problems can be identified. Post installation analysis is valuable in analyzing at-sea problems that might have occurred, identifying possible premature failure locations, and creating a good as-laid record of the installation. As with all of Makai’s cable software, MakaiPlan Pro is built on a Windows GIS platform.. This enables a precise placement of the cable on the seafloor, as well as the ability to import other GIS data such as cable databases, marine protected areas, and more. MakaiPlan Pro contains all the route planning and engineering goals of MakaiPlan and enables users to collaboratively design a cable path with cable engineers, owners, surveyors, and installers, all sharing a unified view of the project data. See Makai’s brochure on MakaiPlan for more details.